The Brazil nut, as its name implies, is common in the tropical rain forests of Brazil and other South American countries. The nut is prized for its high oil content and is also used in various culinary recipes. Grow started Brazil nut trees as seedlings or watch the magic of life from the very beginning by starting a Brazil nut tree from seed. Scarify the Brazil nut. Use coarse sandpaper and rub the outside of the Brazil nut until the shell is evenly grooved and scratched. This allows water to penetrate the shell's hull and more efficiently reach the seed inside. Place the scarified seed in a container or jar and fill the container with water. Soak the nut for 24 hours. This softens the shell. Remove the soaked nut. Use a knife to crack open the Brazil nut's softened shell. Remove the Brazil nut seed inside. Bury the seed 1 inch deep in a gallon-sized pot filled with sawdust. Water the pot twice a day to keep the sawdust perpetually moist. The seed will typically germinate within 60 days, though this varies by seed and can take several months longer. Transplant the Brazil nut seedling to a standard 5-liter fabric bag used in nurseries for trees. Fill the bag with garden loam or potting soil. Exercise caution when moving the seedling to avoid breaking the seedling's long tap root. 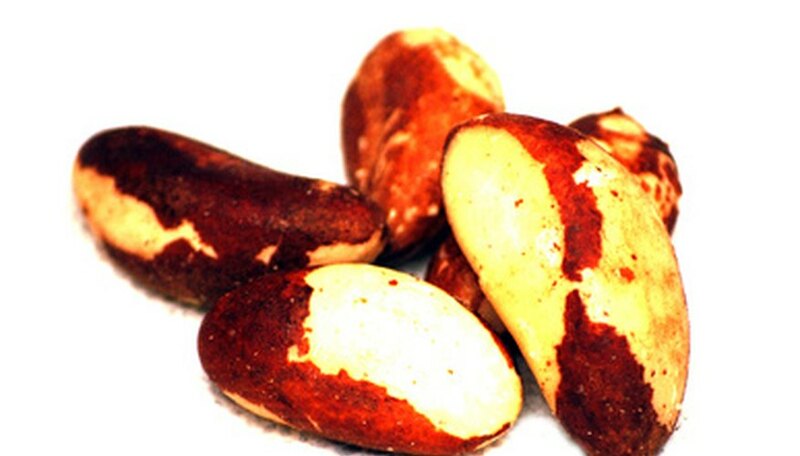 Brazil nuts are typically treated upon importation into North America. This sterilizes the seed. Purchase viable, raw Brazil nuts from a nursery or specialty health food store.